Rosacea (pronounced "roh-ZAY-sha") is a chronic and potentially life-disruptive disorder primarily of the facial skin, often characterized by flare-ups and remissions. Many have observed that it typically begins any time after age 30 as a redness on the cheeks, nose, chin or forehead that may come and go. In some cases, rosacea may also occur on the neck, chest, scalp or ears. Over time, the redness tends to become ruddier and more persistent, and visible blood vessels may appear. Left untreated, bumps and pimples often develop, and in severe cases the nose may grow swollen and bumpy from excess tissue. This is the condition, called rhinophyma (pronounced "rhi-no-FY-muh"), that gave the late comedian W.C. Fields his trademark bulbous nose. In many rosacea patients, the eyes are also affected, feeling irritated and appearing watery or bloodshot. Although rosacea can affect all segments of the population, individuals with fair skin who tend to flush or blush easily are believed to be at greatest risk. The disease is more frequently diagnosed in women, but more severe symptoms tend to be seen in men -- perhaps because they often delay seeking medical help until the disorder reaches advanced stages. Rosacea can vary substantially from one individual to another, and in most cases some rather than all of the potential signs and symptoms appear. 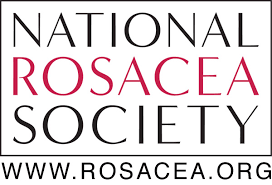 According to a consensus committee and review panel of 17 medical experts worldwide (see Classification of Rosacea), rosacea always includes at least one of the following primary signs, and various secondary signs and symptoms may also develop. In many people with rosacea, the eyes may be irritated and appear watery or bloodshot, a condition known as ocular rosacea. The eyelids also may become red and swollen, and styes are common. Severe cases can result in corneal damage and vision loss without medical help. Various oral and topical medications may be prescribed to treat the bumps, pimples and redness often associated with the disorder. Dermatologists often prescribe initial treatment with oral and topical therapy to bring the condition under immediate control, followed by long-term use of the topical therapy alone to maintain remission. A version of an oral therapy with less risk of microbial resistance has also been developed specifically for rosacea and has been shown to be safe for long-term use. Patients should check with their physicians to ensure their skin-care routine is compatible with their rosacea. A gentle skin-care routine can also help control rosacea. Patients are advised to clean their face with a mild and non-abrasive cleanser, then rinse with lukewarm water and blot the face dry with a thick cotton towel. Never pull, tug or use a rough washcloth. Patients may apply non-irritating skin-care products as needed, and are advised to protect the skin from sun exposure using a sunscreen with an SPF of 15 or higher. In addition to medical treatment, rosacea sufferers can improve their chances of maintaining remission by identifying and avoiding lifestyle and environmental factors that trigger rosacea flare-ups or aggravate their individual conditions. Acknowledgments: This section was reviewed and edited by Dr. Larry Millikan, chairman of Dermatology, Tulane University; Dr. Guy Webster, professor of Dermatology, Thomas Jefferson University; and Dr. Diane Thiboutot, associate professor of Dermatology, Pennsylvania State University.